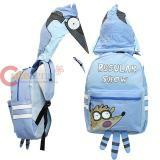 Regular Show Mordecai Hooded Backpack, Large size 16" Book bag Includes top zipper pocket to stor.. Regular Show Rigby and Mordecai Magnet Auto/Car Accessories or any metal surface Flexable de.. Regular Show Group detachable Lanyard with Mini Charm Metal hook with Clear ID pocket Lanyard.. Regular Show Rigby and Mordecai Lanyard with Rubber Charm Metal hook with Clear ID pocket La.. Regular Show Rigby and Mordecai Hinge Wallet - Check Book Hard Flat Wallet A zippered coin pocke.. Regular Show Rigby and Mordecai 3D Face Plush Slippers , indoor shoes Soft and comfy cotton mat..